Negotiation is one of the most important skills in business. Fact. No other skill will give you a better chance of optimising your success and your organisation’s success. 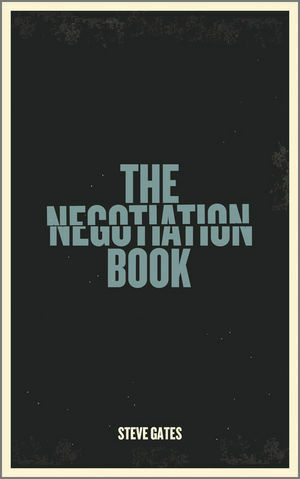 The Negotiation Book is your competitive advantage. That’s something everyone can agree on. Steve Gates is the founder and CEO of The Gap Partnership, the world’s leading negotiation consultancy. Founded in 1997, the company now has office worldwide. Steve and his team of negotiation consultants have advised and developed some of the world’s leading organizations with their most difficult negotiations, dealing with everything from retail trade terms to mergers and acquisitions, oil prices and trade union disputes. Chapter 1 – So You Think You Can Negotiate? Chapter 2 – The Negotiation Clock Face. Chapter 3 – Why Power Matters. Chapter 4 – The Ten Negotiation Traits. Chapter 5 – The Fourteen Behaviours that Make the Difference. Chapter 6 – The 'E' Factor. Chapter 7 – Authority and Empowerment. Chapter 8 – Tactics and Values. Chapter 9 – Planning and Preparation that Helps You to Build Value.